Want more traffic and shares for your content? Use Shareaholic for your blog. 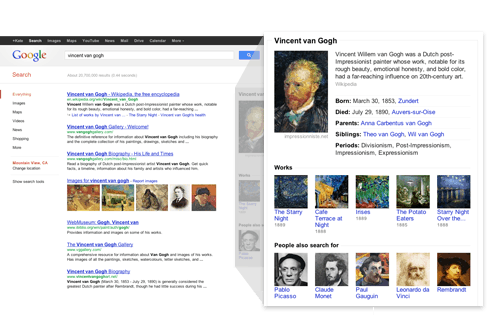 Google just launched the Knowledge Graph update, one of the coolest, most underwhelming things that has ever happened. It’s a huge leap forward in search technology that will make the web safer for the creators of great, unique, sharable content — and a terrifically inconvenient place for anyone using unethical search engine optimization, or SEO, techniques. They’ve done this by making their search engine more like a discerning person, by giving it the ability to essentially poll your friends to see what they’ve liked enough to share, tossing that data in with all of your user info and then aggregating it to make what they hope will be the perfect blend of search results for your query. The Knowledge Graph update appears to have been made manifest as an informative box on the right side of the search engine results page. If you search for Nikola Tesla, for example, you get biographical information, major works and contemporaries – handy information to be sure. What’s going on behind the scenes, though, got me so excited I pulled out my books – and not from computer school but from classes on artificial intelligence and the philosophy of mind. Semantic search has been doing this for a while now, but it wasn’t until Knowledge Graph that it really hit me: search is evolving. Before this update, Google would search for your keywords and hope there was a relevant match for that phrase. Now, although it is still in its infancy, Knowledge Graph knows what you’re asking for. (And if there’s a question whether you meant Tesla the rock band or Tesla the smartest guy ever, it asks.) It actually breaks your search down into people, places, things, verbs, phrases and more — all with unique attributes and other tags. This takes Google from simple knowledge to a kind of comprehension, a full level up in Bloom’s Taxonomy of Knowledge and one step closer to real artificial intelligence. The importance is difficult to grasp. It’s not something that you’d necessarily learn about in web developer training, and it turns out that semantics, cognition and artificial intelligence aren’t subjects everyone gets. Knowledge Graph is not the first semantic search engine. Even if you do understand how nifty semantic search is, it isn’t new. It is, however, now an emphasis of Google’s. According to Shareaholic, Google organic traffic drives as much as 48% of traffic for websites, dominating the search market. Although other search engines like Bing compete with Google’s dominant power, it is clear that there Panda and Penguin algorithms can and will weed out the quality vs. quantity of content online. It still looks mostly like they just added an info box. Try talking to your friends about this update without asking if they’ve seen the box; it’s nearly impossible, and no, they probably haven’t. If, like me, you start thinking about all of the information that Google collects from every search, every Android mobile device, every person using Chrome and, of course, the entirety of the Internet, you start to realize the scale of this project. Look, too, at the cool stuff they’re doing with their data, like making a spell checker that uses their database of what people most often change misspelled words to after making a mistake in their search. It boggles the mind to think of all the data being aggregated and put to use in Knowledge Graph. The possibilities are endless. As a searcher of the Internet, you’ll be more and more pleased with the accuracy of your results and how advanced you can make your queries. If you’re in the business of trying to get your page ranked, though, you might not be quite as thrilled – unless you produce great content. As I mentioned above, good and sharable content is what Google wants to give people becuase it’s what everyone wants, so keep up blogging it up in your own particular idiom, make it relevant and share like it’s going out of style (because it is going out of style – on the Internet, only adorably captioned cats can has lasting appeal). Services like Shareaholic make it easy to cover your posts with sharing buttons and track where they go. The more your content gets shared, the bigger bump you get from social results in the SERPs. As search engines become more advanced, they’ll align more and more with what users want and be able to provide that with increasing accuracy. This means dropping keywords in favor of people, places and things. Obscure and long-tail keyword strings can now be broken down, understood and changed for the ultimate “Did you mean?”. It also means incorporating social results to see what content was good enough to share — a step beyond relevant content. In short, this is a very impressive advancement for search. If your rankings take a dive because you’ve been hoodwinking users into clicking through, you had it coming; maybe it’s time to focus on more useful and truly relevant content. Karl Fendelander cut his teeth on web writing in the late 90s and has been plugged into the newest technologies and trends ever since. With an eye for design and an ear for language, Karl writes about accredited online colleges, search, social media, and much more. When he unplugs, Karl can be found biking about town and hiking and climbing throughout the West.